Fastening House specializes in serving construction and industrial needs (including electrical, mechanical, general contractors, and sub-contractors in the Greater Toronto Area (GTA)). We are proudly Canadian and committed to providing you with what you want when, where, and how you want it. Our story begins in 1958 when Reg Moore, our founder, began Moore’s Tool and Equipment Service out of the basement of his father’s paint and wallpaper store with the aim to provide convenient, on-site delivery to general and sub-contractors in the GTA. As time went on, his success and reputation for affordable, personalized service grew. By the mid-sixties, our focus turned to the electrical and mechanical trades. To reflect this shift, we adopted the name “Fastening House,” evolving to become the specialty tool and fastener authority trusted by customers throughout Ontario. Ken and Keith, Reg’s sons, joined the business in the 1970s. Fastening House’s reputation grew from there, helping us become the vendor preferred by industry manufacturers and customers alike. At the end of the 1980s, Fastening House began carrying a line of aerial work platforms including scissor lifts and booms. We subsequently launched All Trade Rentals, which today carries a fleet of more than 1,000 pieces of equipment with working heights up to 130’. 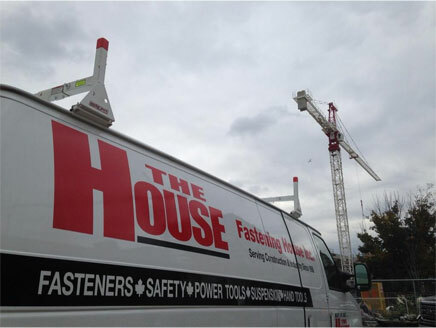 With All Trade Rentals, Fastening House is able to give customers everything they need to get the job done from power tools and accessories to innovative fastenings to suspension systems. Today Fastening House continues to expand on the legacy started in 1958, continuing to offer customers the best products in the industry from our 40,000 square foot distribution centre headquartered just outside of Toronto (in Vaughan). From this location, we serve branches in Mississauga, Ottawa, London, and Windsor. Everyone at Fastening House is committed to working hard for you, providing customers what they want when they want it and doing it right the first time! To passionately strive to exceed our customers’ total service expectations on each and every transaction. Garner enduring loyalty by treating every customer with the utmost respect and politeness, honesty and integrity, and a genuine desire to do whatever it takes to do the best job we can. Unwavering commitment to training, support, and expanding the abilities of each staff member so they can reach new horizons in personal achievement. Forge long term relationships with our business partners based on quality relationships with their employees and sustained achievement of mutual business goals. Build a profitable business and reward the contributions that each member of our employee family makes to this success.